I painted this on my trip to Pescadero at the tip of Baja in January, 2018. 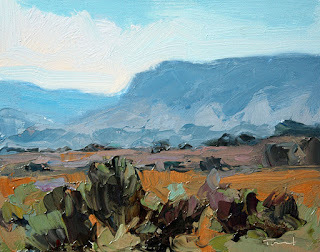 It was an attempt to capture the atmosphere and color of the Sierra Madre and the desert in winter. I have been experimenting with painting knife, but with this painting I went back to the brush. I know there are areas in the Southwest, mountains and desert, that are equally beautiful. There is a special feeling about each place and a painting helps me to remember the magic of a place--in this case, Baja.